Joshua Connor has the Australian version of The Shine. The grizzled farmer senses certain things, like where to drill for water. If he can only get to the blood-soaked beaches of Gallipoli, he is sure he can find the remains of his three sons who died in combat there. That is something the British authorities are not so eager to facilitate in Russell Crowe’s The Water Diviner (trailer here), which opens today in New York. All of three of Connor’s sons enlisted in the ANZACs and all three presumably perished at Gallipoli. When the bitter news drives their mother to her grave, the salt-of-the-earth Connor promises his late wife he will find their sons and bring them home to her. However, Gallipoli is not exactly a tourist attraction in 1919. The British military consul flatly refuses him access to the prohibited beaches. Of course, he is not about to be dissuaded after such a long and arduous journey. Bribing a fisherman, Connor makes his to the fateful beaches, where a combined team of British and Turkish military personnel are working to identify and properly bury as many fallen combatants as possible. Although Lt. Col. Cyril Hughes is a little put off by Connor’s sudden appearance, his Turkish counterpart, Maj. Hasan convinces him to assist Connor’s search. Sure enough, the farmer quickly finds his sons, but only two of them. Through a little bureaucratic digging, Hasan discovers the eldest Connor brother might have been taken captive as a POW. Suddenly, Connor has a glimmer of hope and a knotty mystery to entangle. The British are even more determined to send him packing, but Connor finds unlikely allies in Hasan and his veteran aide-de-camp, Sgt. Jemal. As Turkish nationalists loyal to Ataturk, they are more concerned with the Greek occupation of Smyrna. The fact that Hasan commanded Turkish troops at Gallipoli also makes their relationship somewhat awkward, but the slowly develop a degree of mutual respect. Much to his surprise, Connor also finds himself acting as a surrogate father for Orhan the urchin-like son of Ayshe, the widowed proprietor of the hotel he is staying at. 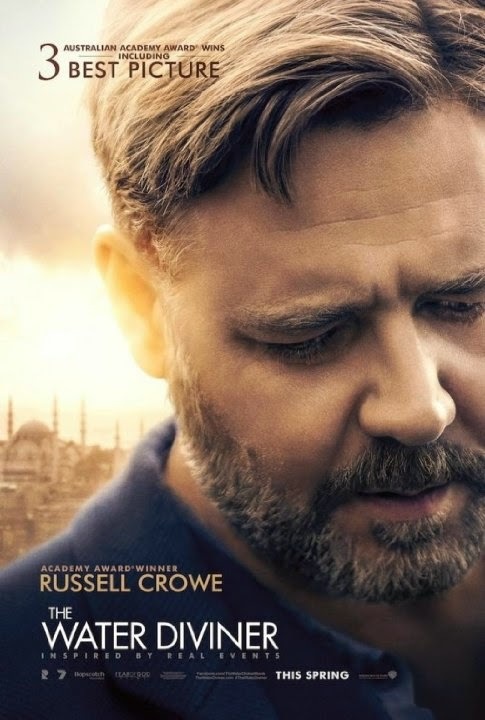 In Australia, Gallipoli is still the source of strong national emotion, so this was a somewhat bold choice for Crowe’s feature directorial debut. Presumably, his countrymen are okay with it, since Diviner tied with The Babadook for best picture Australian Academy Awards. Frankly, Crowe’s film should have had the award all to itself or shared it with the Spierig Brothers’ Predestination. Crowe uses an epic story to tell an acutely personal story—and quite effectively so. Screenwriters Andrew Anastasios and Andrew Knight accurately reference all the macro forces roiling the Ottoman Empire’s final days, but they keep a lot of details hazy, such as Ataturk’s commitment to secularism. These days, Turkey could use a reminder on that score. Nevertheless, it is reasonable for the film to reflect Connor’s naïve confusion with Turkish mores and politics. As his own lead, Crowe is perfectly on-key as Connor, the quietly grieving father. It is the sort of understated performance that pays far greater dividends than overindulgence, over-the-top Meryl Streepian wailing and garment-rending. The French-Ukrainian Olga Kurylenko also puts the “hot” in hotelier as Ayshe, developing some better-than-you-expect chemistry with Crowe. However, it is Yilmaz Erdoğan who really puts a stamp on the film, oozing integrity while avoiding cliché as the hard but compassionate Maj. Hasan. There are a lot of potential potholes in Diviner, including Connor’s prophetic dreams and his chaste non-courtship of Ayshe. However, Crowe consistently brings a light touch to bear in scenes other directors would drive into the ground. More often than not, his filmmaking instincts are correct. Recommended for those who enjoy sweeping historicals, The Water Diviner opens today (4/24) in New York, at the AMC Empire.